It’s been busy day that’s been a little disappointing in one respect, but encouraging in others. I had been expecting a call back from a recruiter today about a job that I’d been interested in – but when he didn’t contact me by midday I decided to call him instead. That particular job is no longer available – and after discussion – even if it was the role would have been unsuitable for a number of reasons. One of these is that (my paraphrased words not his) I have more experience than the role requires. I have mixed thoughts about this – on one side I’m glad that I’m being recognised as someone that has a lot of good employment history – on the other it doesn’t really help me too much with my current fiscal needs. It seems that I’ve initially set the employment bar at the incorrect height, and I think tomorrow I need to revisit this and maybe do some further work on my CV. On the plus side I had a long chat with the recruiter and got on quite well with him. If nothing else I’ve added someone to my list of people to speak to in the future. Everything I guess is in some way or another a step in the right direction and there’s nothing about this process that’s truly negative. It’s all a learning experience and is less about what happens and more about what you’re willing to take from it. I choose to look at the good rather than the bad. I probably feel like this because if I get stressed I can walk it off. The last couple of days have been pretty good for this weather wise and I’ve been rather impressed at how good my body has felt after a short recuperative break. 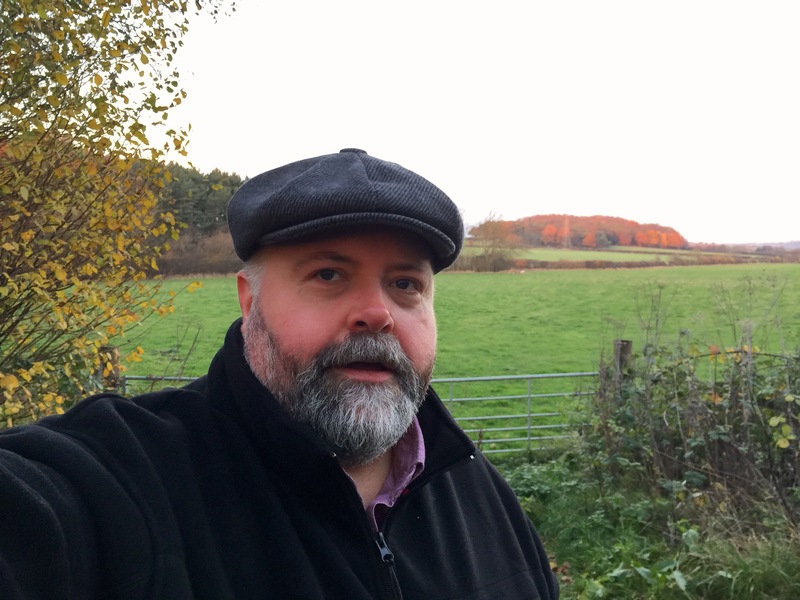 Two nights ago I went for an early evening stroll, intending it to be nothing more than a contemplative meander. However it turned into something of a race with myself – and an uphill one (physically rather than metaphorically) at that. I found that rather than feeling like I was dying on the incline I was instead speeding up. This was partially because the sun was going down and I hadn’t brought a torch, but also because I was really enjoying the exercise. This came as a complete surprise to me given my leg problems – and I kept pouring it on to see if things would begin to cramp up. Oddly they didn’t and I managed just over a 19 minute mile (mostly) uphill. My heart rate also seemed to be stable at around the 125-130 range and I felt GOOD. The walking was more sedate this morning though – as it was a chance to catch up on a friend’s week as we wandered around the park. As I approached the sun seemed to be hitting the river at the perfect angle and its webbed feet were clearly visible under the water, moving it behind the scenes effortlessly towards and then away from me. I love it when the water is clear and you can see what goes on beneath its regal plumage. It’s like seeing a spellbinding play and being able to look behind the sets or curtain at the artifice being constructed invisibly behind. 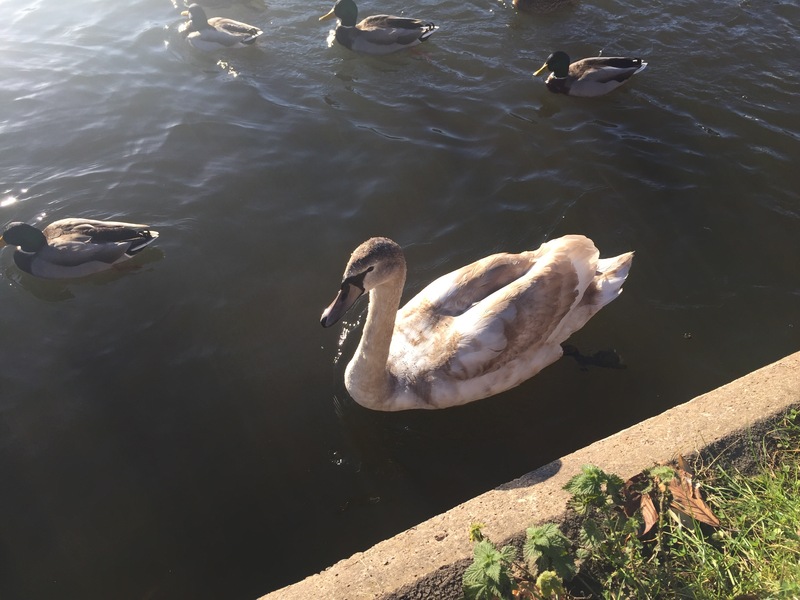 It’s beak is STILL not orange, but the rest of it is becoming whiter by the moment, and when the swanling lifts its wings the feathers underneath are almost completely those of an adult bird. The park and its occupants looked quite lovely today – with yet another beautiful blue sky (several days in a row now!) and not a single cloud in sight – although it was pretty darn cold. This never used to phase me, but I definitely notice it in my feet and fingers now neither are quite so padded. I’ve taken to wearing gloves lately which is unusual for me – but a nice change. I also know my feet are smaller because I can again wear shoes that had previously become too tight. I also have to put on thick socks for my boots to keep my feet from moving around too much. It’s a nice feeling to be changing bit by bit. A lot of things are these days though. I mentioned in my Slimming World Facebook group earlier today (it’s a lifeline sometimes when you’re struggling) that I’d become aware that just moving around the house had become radically different lately. Walking up and down stairs is much much easier and quicker – and if I forget something I go straight back up and get it rather than leaving it till later, which I used to do. This was also in evidence yesterday when I visited a friend’s brand new flat to drop a TV off. I was going over for the first time, and had no idea where it was or what it looked like until I got there. She met me at the door, with a cheerful but shy toddler in her arms. ‘It’s up two flights of stairs’ she said smiling. This in the past would have been bad enough for old Dave without a TV in his arms, and he would have subsequently been in all kinds of trouble because there were no seats in the flat to sit on and recover. Not so for new and improved Dave. This version of Dave can not only carry heavy objects up flights of stairs unaided but new and improved Dave can also continue a conversation while doing so! Then upon arrival this better version of me can walk casually around the new abode (which is lovely) and comment on where to put the furniture (over there, not THERE). I’m sure that I’m boring people to death with pointing stuff like this out but I’m loving the sudden and happy shocks that come with a realisation that something has just naturally changed. I’m hoping that something else that’s about to change (with maybe a little intervention) is my water bills. 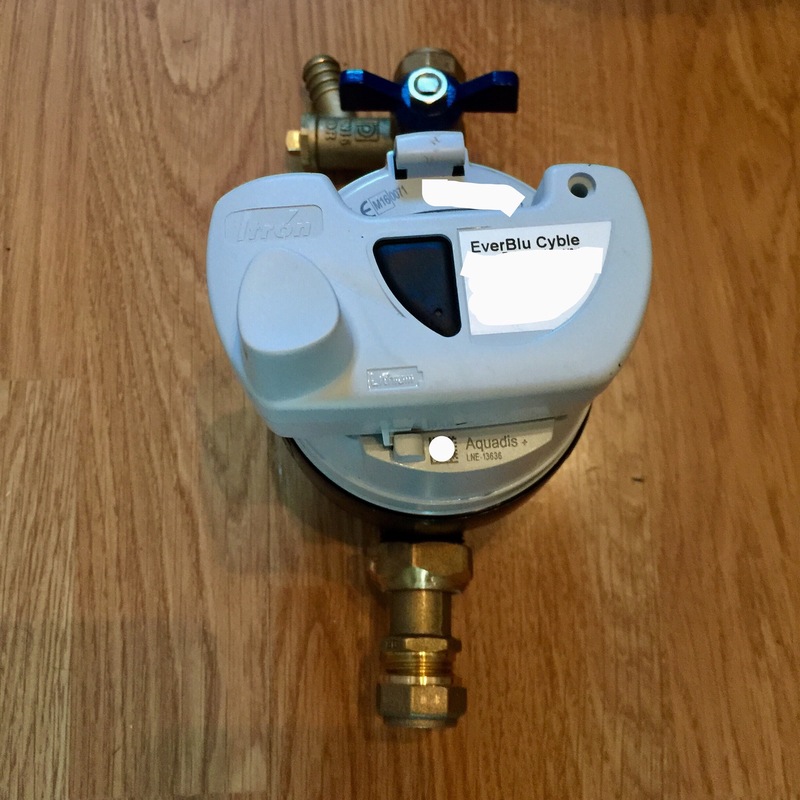 On the advice of the friend with whom I wander regularly around St Nics with I finally had a water meter fitted in my house today. Compared to my current ‘water rates’ billing this should save me (hopefully) around £160 per year – which is pretty frikkin awesome. I’m really rather enjoying learning to live within my (new) means at the moment and shaving money off bills wherever I can. I can’t see why I’d want to go back to my old habits. In many ways redundancy was a blessing in disguise that opened my eyes to a lot of things which previously, in my comfortable little bubble I was completely insulated from. Hopefully Internet this resolutely frugal attitude I’m currently afflicted with will mean that when I do get another job (and I will) it will means I’ll be able to earn less, save more and also not worry about the future. Yes, but thankfully you have heaps of workexperience and aren’t looking for a traineeship (I presume). 😉 So I am sure you will do just fine. Keeping my fingers crossed for you.